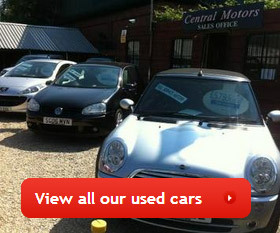 Established over 35 years, we are a second hand car dealer based in Lye, Near Stourbridge in the West Midlands. Now in our third generation of the Perrins family, Central Motors offer a wide range of carefully sourced quality used cars and work continuously to ensure that our prices are competitive. We are confident that we can help find what you are looking for with over 40 cars in stock and others arriving daily. FINANCE AVAILABLE FROM 5.9% (subject to status). Our finance arrangements are simple. We can take your details on the same day you view a car and quote you there and then. Once you are happy and the finance is in place you can sign and drive away the same day! For more information call us on 01384 895 665 or pop in and see us today. Terms and conditions apply.